The Lakewood Lakers 2019 Spring/Summer Program gets underway Monday April 22. The Lakewood Lakers have partnered with the Colorado Avalanche to be a host association for the Mile High Mites Learn to Play Hockey Program. The program is for kids born between 2009-2013 that are interested in trying out hockey. Coaches Announced for the Lakewood Lakers 2018-2019 Season. Starting June 14 & 15 the Summer Program for the Lakewood Lakers will begin. The full schedule is posted on our calendar. 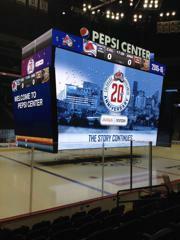 The program will consist of 2 hours per week on ice along with an off-ice training session. The below flyer has all the information. The Lakers 2018 Spring Program gets underway April 3 and runs through the end of May. The program consists of 2 hours of in ice instruction per week with some potential games later in the spring. The cost for the program is $250 per player. Below are links to the informational flyer and the schedule. It comes with great excitement that the Jr Eagles announce our re-brand. Beginning in the Spring of 2018 the Jr Eagles will become the Lakewood Lakers. We are extremely excited about this re-brand as we are planning on this new image to help us continue to grow our competitive program in the metro Denver area by connecting with our Lakewood community. More news to come for the Lakers Spring & Summer Programs. The CO Jr Eagles Bantam Red team will represent Colorado at the 2018 International Silver Sticks Tournament in Pelham Ontario January 11-15. The team qualified by reaching the finals of the Westminster regional tournament in February. We will be starting our U8 program Friday October 6. The program this year will offer 3 different options for families. Option 3 will be both Friday and weekend ice time. Option 1 and Option 2 will be 1 hour a week for $200. The season will run from October-February. Option 3 will be 2 hours of ice time a week and will be $375. The kids will also be playing scrimmage games with other local programs and will attend a few jamboree events during the season. I am getting our registration system updated with the different options. Please use the below link to register your player for the program if you have not already. The Jr Eagles are proud to announce George Wolff will be joining the Jr Eagles staff for the 2017-2018 Season as the programs U8 Director. George returns to the Jr Eagles after 5 years away from the program where he coached from 2005-2012. George brings over 15 years coaching experience to the Jr Eagles. George has operate his own Powerskating & Stickhandling camps since 1999. Coach Wolff has coached teams at every age level and brings a great skill set to the Jr Eagles. The Jr Eagles are very happy to add Coach Wolff to the program. The Jr Eagles are now accepting registrations for the 2017-2018. Please click on the "Registration" tab on the menu bar. The Jr Eagles have been approved by the Colorado Competitive Youth Hockey League (CCYHL) to compete beginning this coming 2017-2018 season. This is a great opportunity for the program to continue to grow and compete against the rest of the great programs in the metro Denver area. The Jr Eagles Squirt/Pee Wee/Bantam teams will join the CCYHL. The 2016-2017 Jr Eagles Season will begin on Friday September 9. All teams Squirt, Pee Wee, Bantam, Midget, Columbine will begin skating the weekend of September 9 at Foothills Ice Arena. The full September schedule will be released once completed. The DNHL Jr Eagles teams entered the league playoffs this past weekend holding 3 of 4 top seed's. The Bantam Red, Pee Wee Red, and Squirt Red teams took the #1 seed with the Pee Wee White team holding a #2 seed. The Squirt team faced a tough opponent in Summit County. The game was back and for with Summit coming out on top. The Squirt players battled hard and same up 1 shot short, but they had a great season. The Pee Wee White team had possibly the most exciting semi-final game of all time. The team faced off with Hyland Hills Orange. The team fought back and forth and entered over time tied 0-0. Neither team could punch in the winner during the 3 on 3 over time period. Finally after 5 rounds of a shoot out, the Eagles fell to Hyland. Regardless of ths loss the kids have a great memory of one fantastic game. 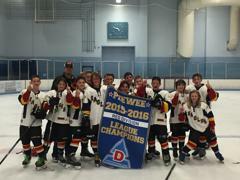 The Pee Wee Red team entered the DNHL playoffs as the #1 seed with a record of 19-0. The team faced 2 tough opponents in NCYH in the semi-finals then Hyland Hills Black in the finals. The Eagles held off both opponents and became the first team to complete the perfect season for the Jr Eagles by finishing a perfect 21 wins 0 losses. The Bantam Red team also entered the DNHL playoffs as the #1 seed with an impressive 15-1-1 record. The team came out on fire winning the semi-final game 6-1 against Hyland Hills. 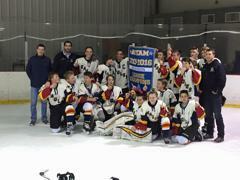 Then in the Championship completed their Championship run by winning by a margin of 7-0 against NCYH. Congratulations to all the Jr Eagles DNHL teams for a fantastic season. Below is the link to the 2015-2016 Jr Eagles Merchandise Store. The Lakewood Lakers have partnered with the Colorado Avalanche to be a host sponsor for the Mile High Mites Learn to Play Hockey Program. The program is for kids born between 2009-2013 who want to try out hockey. All kids receive a full set of equipment along with 6 hours of ice time. For registration info please visit the link below.